During t he 2014 International Year of Family Farming (IYFF), FAO and various partners and stakeholders expressed the need to go beyond the celebrations and to put in place a set of concrete actions aimed at addressing issues and challenges raised throughout the year. In response to that, the decision was made to implement a web-based knowledge platform that could share information and knowledge on key topics and the state of policy making related to family farming across the world. The platform represents one of the main and long lasting legacies of the IYFF 2014, as a worldwide reference to facilitate informed decision-making on family farming policy processes. It integrates and systematizes existing information to better inform and provide knowledge-based assistance to policy-makers, family farmers’ organizations, development experts, as well as to stakeholders in the field and at the grassroots level. 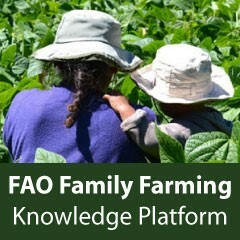 By gathering a huge amount of diverse information and knowledge, the platform showcases the enormous contribution that family farms towards addressing some of the most pressing challenges we face today, such as food security and the needs for sustainable food systems that preserve natural resources in times of climate change and the challenges they face. In addition, the users can find all kind of information on the work of FAO in the headquarters and at the field level to help family farms prosper. The FFKP is directed to all those involved in family farming and rural development related issues: from farmers’ organizations to Governments to universities students, the audience is quite transversal. In addition, the FFKP allows its worldwide contributors and focal points from national governments to collaborate. Currently the Platform includes more than 100 focal points appointed by their governments and another 100 contributors worldwide. A strong coalition of stakeholders sharing their knowledge is the foundation of this initiative. Contributors and focal points therefore play a vital role in this project, since they are not only FFKP users, but they also regularly feed the database with updated and relevant material. Two years from its launch, the FFKP databases includes more than 15 000 documents and has already been visited by approximately 170 000 users since its launch, in June 2015. TBTI has been a regular contributor to the FFKP since 2016.